So sad to see the Knights move away from Zimbabwe back to France, we are sure going to miss them! What a time of the year to move, from the mid summer heat of Bulawayo, Zimbabwe, to the Mid Winter cold of Europe! Cecile has been a volunteer at Healing with Horses for many years, and William has ridden with us since he arrived from France many years ago, a shy boy who APPARENTLY never said anything to anyone. Well, we never saw that side of him, he had plenty to say when he was with us! Having William at a pony camp was the same as ordering your own private clown, but when he thought no one was looking, he was actually a very kind and accomplished horseman! 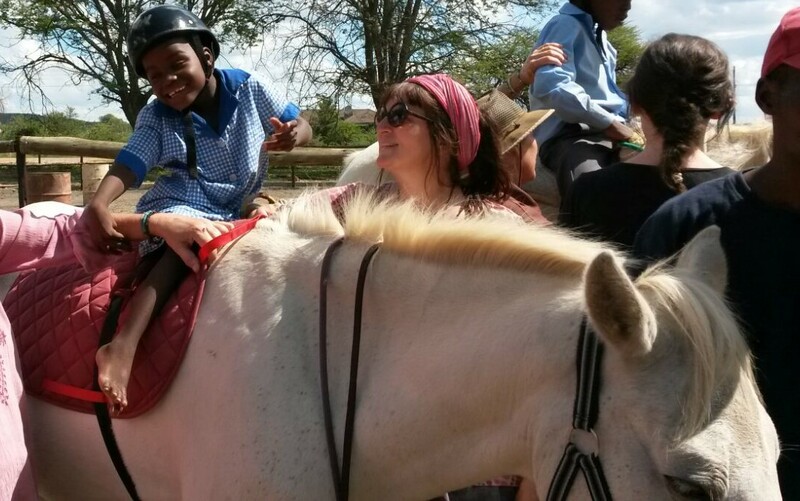 Cecile always brought bright sparkly colours and energy into our sessions, and art into the lives of the children, who learnt about all sorts of things, particularly chameleons, while they were waiting for their turn to ride. We are really going to miss you guys, come back soon! Before she left for France Cecile did an amazing thing for Healing with Horses, she donated money for two children to undergo therapeutic riding during 2019. This was an amazingly kind gesture, and one which is going to change the lives of two special children. Thank you so much Cecile and the Knights, for helping to change the lives of two children in our community. Or message us on facebook, Healing with Horses Therapeutic Centre, Zimbabwe. Phone +263 773 472 225. There are so many ways to become a part of the family at Healing with Horses by volunteering, you can volunteer your time and muscles at sessions, you can lead during sessions, entertain the children who are waiting to ride, groom horses, exercise horses, muck out stables, weed, plant grass, enter data on the computer! Something for everyone, if you have time to offer we can find something for you to help with. Or, like Cecile, you can donate money towards therapy sessions for children, or support feed hay shoes etc for a therapy pony. We appreciate all you do for us. Thanks once again to the Knights for the years of dedication to Healing with Horses, and we wish you all the best in France, even though you are all the way over there you will always be a huge part of our family here at Healing with Horses.